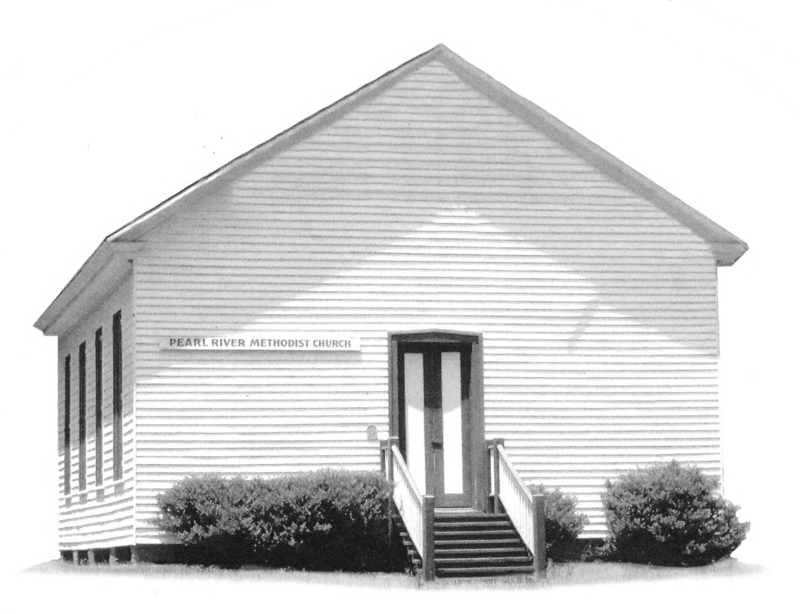 Pearl River Church is the home church of the Lambuth family, which holds a unique role in the history of Methodism as ministers and missionaries dating back to the early 1800s. William Lambuth, born in 1765, became a Methodist minister serving first in Virginia, then in Kentucky and Tennessee as a missionary to the Indians and white settlers. One of his sons, John Russell Lambuth, became a Methodist minister and in 1843 moved with his family to Madison County not far from the Natchez Trace, near what is now known as Pearl River Church. The church included a school, Pearl River Academy. Points of interest at this Heritage Landmark: A historic cemetery is part of the property; ten Lambuth family members are buried here under the shade of magnificent hardwood trees. The church is a single room, single story wood frame construction originally built as Pearl River Academy in 1843 and remodeled in 1889 using many materials from the original building. Heavy timber floor girders support heart pine tongue and groove flooring. The beams are partly hewn and partly sawn and have evidence of old tenons, pegs, notches, etc. which indicate an earlier use. Most of the framing materials and siding are cypress. The interior of the building includes wooden pews with center divider and pews on either side of the pulpit area facing inward. With no electricity or running water, it remains today much as it was when the Lambuth family worshiped here. Special events: Each year a memorial service is held at Pearl River Church in honor of the Lambuth family ministers and missionaries – Lambuth Day. The name “Lambuth Day” was first used in 1927 and has been observed annually since then on the first Thursday of October. Special emphasis is given to missions; a tour of the cemetery with Lambuth graves marked is offered; a picnic on the shady church grounds is provided. Active weekly services at the church have been discontinued, but the church remains under the care of its Historic Council, the MS Conference Commission on Archives and History, and the nearby Madison UMC. Area attractions: The rustic site of the church is in an area originally part of the Choctaw Nation. From 1801, Puckshunubbee was chief of the western region of the Nation and moved to the area around 1807. The location of his house has been meticulously documented and is one mile south of Pearl River Church. Chief Puckshunubbee, who died in 1824, was chief when treaties were signed to cede much of the Choctaw land to the U.S. in 1805, 1816, and 1820. The location is also near the Natchez Trace, a historic trail used by pioneer travelers between Natchez, MS, and Nashville, TN, which is now a roadway and part of the U.S. National Park Service. To visit: The church property is fenced but not locked; the building is open for visitors. Parking is available on site; there are no restroom facilities. Contact Debra McIntosh for more information. Location: Within the boundaries of the Mississippi Annual Conference on Pearl River Church Road, Madison County, Mississippi. Food and lodging: Many options in the metropolitan Jackson area, which includes Madison and Ridgeland. Closest hotel is Hilton Garden Inn, Madison, Mississippi. Directions: From state capital, Jackson, MS, take I-55 North to Madison Hwy 463 exit. Exit right, go 1.5 miles to Hwy 51. Turn left/north, go 2 miles to Green Oak Dr. Turn right/east, go 3 miles to Pearl River Church Road, which forks right off Green Oak. In less than 1 mile, church is on the right. For further information, contact: Debra McIntosh, Millsaps Library, 1701 N. State Street, Jackson, MS 39210, 601-974-1070; archives@millsaps.edu or Dr. Sue Lauderdale, Chairperson, Pearl River Church Historic Council, sclaud615@gmail.com. Rob Webb, Mississippi Annual Conference Commission on Archives & History Chair, P.O. Box 494, Prentiss, MS 39474, 601-792-4956; rowebb16@bellsouth.net.